Photo by: Rodrigo Wolff Apolloni. 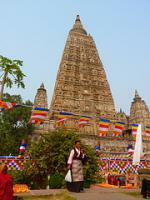 The Mahabodhi Temple Complex at Bodh Gaya is one of the four holy sites of Buddhism. It is the location where Siddhartha Gautama, the Buddha, attained enlightenment. The current temple dates from the 5th and 6th centuries. Being one of the few surviving examples of early brick architecture in India, it has yielded significant influence in the development of architecture in brick. The site is located in the city of Bodh Gaya, Bihar. It consists of the main temple, six sacred places within an enclosed area and the Lotus Pond, just outside the enclosure to the south. Being an Indian and a history student, I've always been inclined towards these icons and iconic places. Siddhartha Gautama as the Buddha was named at the time of birth had a sheltered upbringing within the palace away from all the harsh realities of the world. And one day when he visited the city with his charioteer , it turned out to be traumatic. He was sad after seeing so much sadness and destruction around. Soon after this he left the palace and went out in search of his own truth. Thus , Gautama Buddha meditated for several days under a banyan tree which is famously known as Bodhi tree and had attained enlightenment. Hence, Emperor Asoka visited this site and thus got this temple constructed. 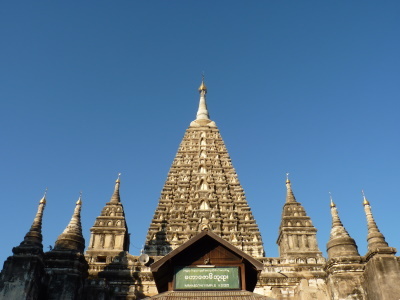 Mahabodhi temple is thus one of the few surviving examples of early brick architecture in India. Thus this place is very peaceful and worthy enough to be visited. When one visits this place , there the ambience is very mesmerising and calm. I visited this WHS in January 2012 during the 32nd Kalachakra when the Dalai Lama visited the Great Stupa in Bodh Gaya. It is a great place of gathering, recollection, sacrifice, prayer and helps you get in touch with your inner self. The Tree of Life and the prostration of Buddhist people coming from all over Asia was the highlight of my visit. The Sitting Buddha inside the Great Stupa is simply beautiful and a monk constantly changes the Buddha's orange robe with others offered by different worshippers. A unique WHS for its religious, historical and cultural importance. The Mahabodi Temple complex provided us with an interesting visit and, in conjunction with prior and subsequent study, a number of surprises regarding its historical and current status! It is situated in the state of Bihar around 12kms south of the railhead of Gaya (We reached it by “fast” overnight train from Kolkata - dept 22.00 arr 05.20) in what has become a significant pilgrimage/tourist town in which many Buddhist countries/sects (including China, Tibet, Japan, Bhutan, Thailand, Vietnam and Burma/Myanmar) have, in relatively recent years, built their own temples. There are also meditation centres and a Buddhist university etc. So the town is a hive of people who are there for religious purposes – mere “tourists” are very much in the minority! The first notable aspect for us was the realization that the structures one views were all largely built since the site’s “rediscovery” in the 19th C. The restoration work was led in the 1880s by the British archaeologist Sir Alexander Cunningham (he set up the Archaeological Survey of India which today runs many of the Indian Cultural WHS). The original temple on the supposed site of Buddha’s enlightenment around 480BC goes back to Ashoka in 250BC, with further construction over it in the form of a mainly brick structure during the later Gupta empire in the 5th/6th Century AD. Buddhism however gradually declined as a force in India and, with the Mogul invasion, faced virtual extinction there by the 13th C. The temple appears to have been largely destroyed and abandoned at that time –certainly by “Buddhists”. In 1802 the Burmese sent a mission which re-established the location’s credentials and, subsequently, British archaeologists carried out inspections and started excavations in the 1860s. Fuller excavation and reconstruction commenced in 1881 with Burmese assistance. Cunningham faced problems of how to design this reconstruction but had descriptions from e.g Hieun Tang in 7th C and also contemporary “models”/carvings of the temple existing locally (e.g at Sanchi) and abroad. It is clear that it is very important to Buddhists to establish as much authenticity as possible and I have found it difficult fully to disentangle belief from fact. So, it is stated that excavations have established that, within the crumbled remains from around 450AD, there was also the heart of the earlier Asoka temple with its Vajrasana Throne (the exact spot where Buddha achieved enlightenment and the reputed centre of the Universe) and of many of the original “railings” which surrounded it. It is also asserted that the Bo tree growing over the Vajrisana is “a direct descendant planted in 288 BC from the original specimen.” (Wiki). It is known that a new tree was planted in the 19th C but the “story” is that the seedling came from Anurhadapura and that the tree there was a direct descendent! As for the external shape of the Stupa – well Cunningham himself wrote “This additional work has been much criticised, and I have been roundly abused for it …….although I had nothing whatsoever to say to it. At the same time I must confess that, since I have seen it, I think this design of the front pavilion is a very successful completion to the entrance in the style and spirit of the original work, as shown in the model. It is of course a 'restoration' which, as it was based on the double authority of existing remains and an ancient model, I consider legitimate and justifiable." So - what of our visit? We spent about 2 hours there relatively early in the morning – first as the “overnight” pilgrims were departing, and then later as very large numbers of day pilgrims began to arrive. We got straight into the inner sanctum of the temple but, as we left, large queues were building up. To my eyes the architecture is nothing special – not for instance compared with the gopurams of S India. If one isn’t there for “religious reasons”, then the value of the visit lies almost entirely in picking up the “connections” with Buddha and the atmosphere/views one gains from the Buddhist pilgrims going about their “religious business”! There is far more to the site than the towering main temple and the Bo tree just outside it. It is a sprawling complex and, dotted around, are 7 marked spots where Buddha is regarded as having spent time carrying out specific actions in the 7 weeks immediately after his “enlightenment” experience. Beyond and between all these are extensive gardens filled with parties of Buddhists from various countries worshipping en mass. We were somewhat surprised by the number of “westerners” – “Meditation” holidays seem to have become “big business”!! To us, the Bodhi tree, the Cloister Walk (Cankamana – photo. Buddha is believed to have spent his 3rd week walking up and down there. On the platform Lotuses are situated where Buddha rested his feet ) and the Diamond Throne ((Vajrasana) were the highlights - plus the gold covered Buddha statue inside the main temple continuously being "re-robed" with gifts of cloth from pilgrims. We could happily have spent more time picking up the atmosphere as it changed through the day and even visiting some of the other (non-UNESCO) temples around the town – but our planned route required us to move on to the T List site of Nalanda some 80 kms north! Bodhgaya was not particularly interesting or visually attractive but was an important and symbolic destination for me. To see the descendant of the tree of enlightenment and to make this personal pilgrimage was a once in a lifetime act. Bodhgaya was done as a day trip from Patna by train. As a 17 year old girl I visited the Mahabodhi Temple in Bodhgaya along with all my family members(which included my mother,father,brothers,sister,Uncle and Aunty)in 1986. The journey till Gaya was by train ,and we had to take a local tourist bus to get to Bodhgaya.We arrived two days prior to the Vaisakh Purnima (the birthday,Enlightenment day,and the Mahaparinirvana)day of the Buddha. Our experience of visiting the Mahabodhi complex was exclusively an interesting,special,and very spiritual one. Just for the sake of a spiritual experience we decided to stay in the Buddha Vihara run by the Tibetan Lamas. There were some tourist from France,and Germany, who were also living in the same Vihara.My family made friends with the tourist from France called Shantimati(thats the name she used for herself even though she had a French name).One thing I remenber of Shantimati saying was ,if given a choice she would like to stay near the Mahabodhi complex forever with tears in her eyes.The feeling and the Spirituality of someone who travelled seven seas just to see the Mahabodhi temple really touched me.Being born and brought up in India I was aware of the spirituality of the Buddhists for Mahabodhi complex but the spirituality of the foriegn tourists was a lot amazing and touching. This Vihara is about five to ten minutes away from the Mahabodhi complex,quite a convenient place for many people. The Lamas were so generous and so happy with the time spent with my family that they refused to accept any fees for the stay.So we offered Donations to the Vihara in response. Early morning at around 5.00am my entire family used to join the prayers of the Lamas.As we were used to the Thervada Prayers we could not really understand the recitals of the Lamas but we really learnt a lot about their methods of praying. On the day of the Vaisakh Purnima my mother cooked special dish for the Lamas as an offering and also carried that to the monks of the Mahabodhi temple. We joined the prayer ceremony on the Vaisakh Day at the Mahabodhi temple. The unique construction of the Mahabodhi complex by the Great King Ashoka speaks volumes not just about he spirituality and faith of the person in restoring the lost glory of Buddhism back on the pedestal but the architectural science of that times which only used hand tools.The engraved Life-stories of the Buddha in the stone,the fineness with which they have been carved in the walls of the stone,the huge statue of the Buddha,is all worth praising and memorable and depicts the knowledge and intelligence of those times. The Pipal tree under which the Buddha attained Enlightenment, though not in the same form as existed during those times,but a tree grown from the sprouting is definitely a place to find a few moments to meditate for the religious people. Under this Pipal tree I made a wish on the Vaishakh day at the age of 17 to be a Dentist and I was successful in that. We also took the opportunity to visit the Niranjana river which is dry in the month of May,and also visited the smaller Buddha viharas in Bodhgaya. Indeed that was the most memorable visit of my lifetime. Mahabobodhi Complex is very interesting. You can feel the anciant atmosphere and the "faithful buddhist scenario". Is it possible to see old stupas, little and big Buddha statues, tibetan devots, monks, tourists, prayers, poor people, children and dogs (! )living in peace inside complex. The train travel between Varanasi and Gaya is, too, absolutly interesting. Trains are old, ugly, dirty...sensational! Brick architecture: "The site has had significant influence in the development of brick architecture over the centuries"
Prophecies: When the world is destroyed at the end of a kalpa, the Bodhimanda is the last spot to disappear; when the world emerges into existence again, it is the first to appear. A lotus blooms there, bringing it into view, and if a Buddha is to be born during the kappa thus begun, the lotus puts forth flowers, according to the number of Buddhas. Built in the 5th century: Criterion i: "The grand 50m high Mahabodhi Temple of the 5th-6th centuries "
48 Community Members have visited.